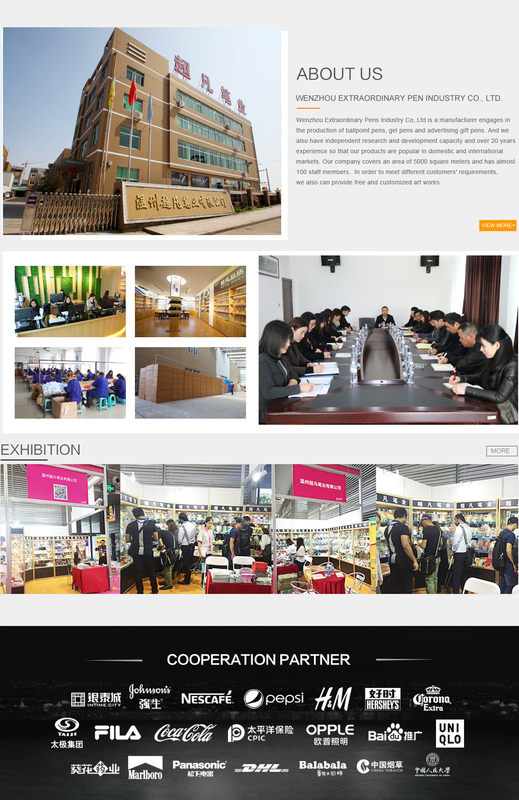 Wenzhou Extraordianry Pen Industry Co.,Ltd. 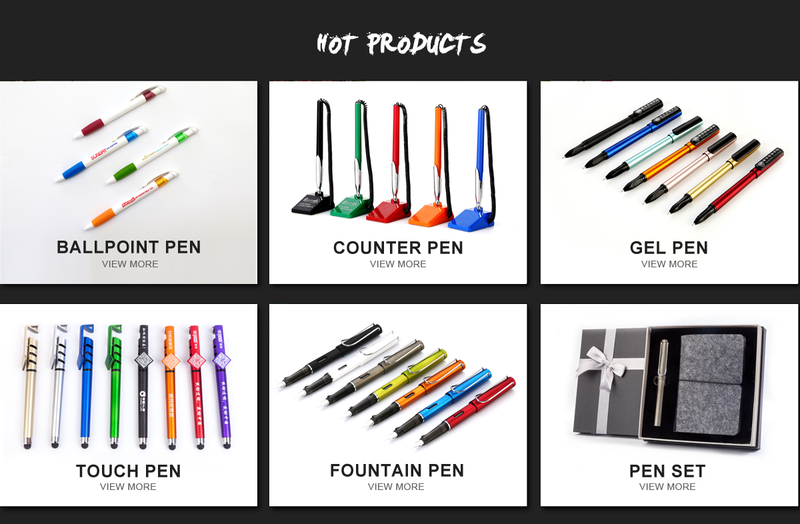 We have been in pens for 20 years and are specialized in producing ball pen, gel pen and gift pen set. And we are famous for superior quality, competitive prices, first-class craft works, safe package, and prompt delivery. we provide OEM services and accept customized order as well. We sincerely welcome friends from all over the world to visit our company and cooperate with us on the basis of long-term mutual benefits. We have over two-decades experience in R&D to ensure that we provide our customers with top quality and innovative products. A number of design experts are employed to research and develop for updating new products. And we also provide sample custom-making Founded in 2002, Wenzhou Extraodinary Pens Industry Co. Ltd is a manufacturer engages in the production of pens, plastic crafts and mental works . Located in Pingyang County Wanquan Town Business Gifts Production Base, Zhejiang province, we enjoy convenient access to major transportation networks. Our company covers an area of 8658 square meters and has almost 100 staff members. As a pen manufacturer, our company specializes in the production of ballpoint pen, banner pen, roller pen, gel pen and counter pen etc advertising gift pen. 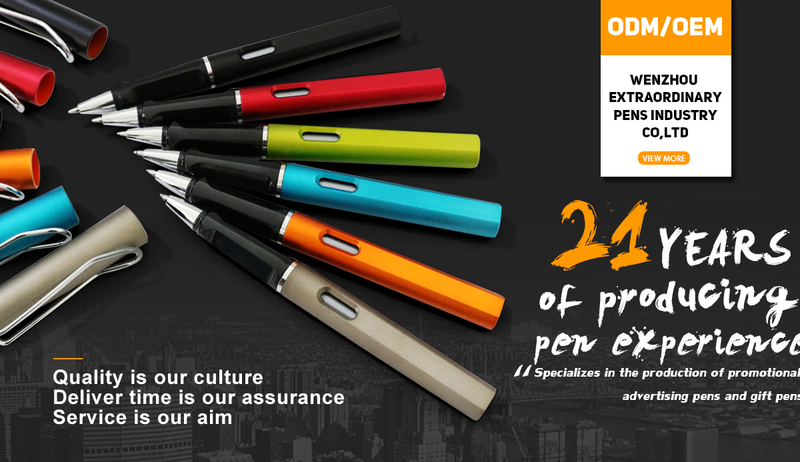 Our company's core advantage is we can customise pens according to the customers' requests of the size and logo or the samples the customers provided. Our annual output is 16.8 millions and the annual sales volume is about 12 millions. With good quality, reasonable prices and stylish designs, our product is exclusively popular among banks ,various kinds of enterprises and other industries. Selling well in the domestic market, our products are also exported to clients in such countries and regions : America, South Korea and Spain etc. All our products are manufactured with advanced equipment and strict QC procedures in order to ensure high quality. A number of design experts are employed to research and develop for updating new products. Our focus is on R & D to ensure that we provide our customers with top quality and innovative products. With sound business credit and modern manufacturing facilities, we have earned an excellent reputation among our customers. We have over 10 years experience in our filed. These years, our products have awarded China light product safeguard center quality assured products and acceptable product of national standard; our company has praised as 2007-2011 the national consumer credit-worthy organization and 2008-2011 integrity private enterprise. We will keep going and crate greater success. Our tenet is prestige first, quality first and customers first. Our company hold and will always hold this spirit and principle to provide customers come from all over the world with satisfactory products. Our company can provide customers products according to their different needs, so welcome to sample customization. We warmly welcome customers domestic and aboard to establish corporation and create mutual success.